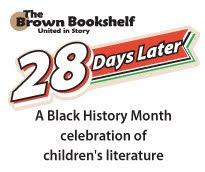 Once again, The Brown Bookshelf is celebrating Black History Month with 28 Days Later: A Black History Month Celebration of Children's Literature. The 2010 Poster for 28 Days Later is available for download. Like most people, I believe that books by African American author are not just for February. For example, Marguerite Abouet (the first featured author): "Aya , her graphic novel series, taps into Abouet’s childhood memories of Ivory Coast in the 1970s, a prosperous, promising time in that country’s history." So right there, Aya would fit with any type of booklist or blog series or challenge about graphic novels, historical fiction, the Ivory Coast. Abouet was born in the Ivory Coast and now lives in Paris, so also fits into any list, series or challenge about writers who aren't American residents or citizens. I really like the Aya books. My BFF was in the Peace Corps in Niger, and I had the chance to visit her, so reading them is doubly interesting.